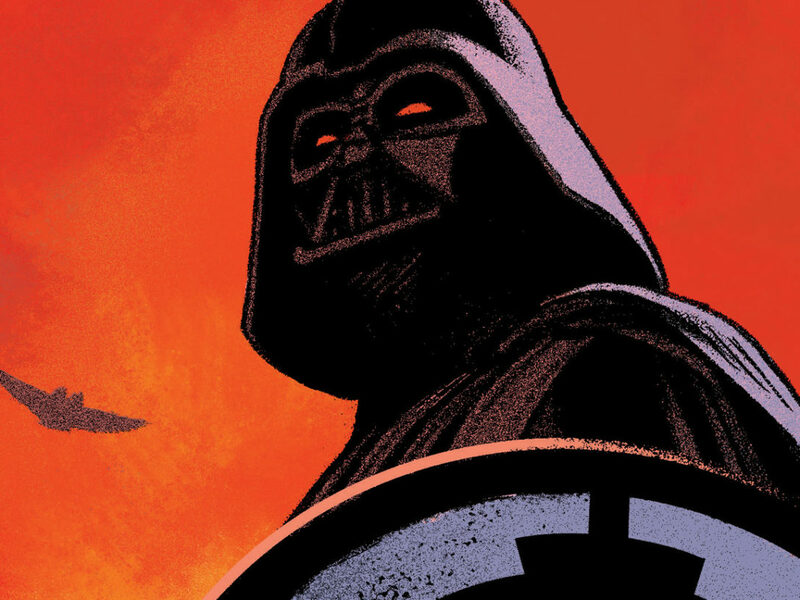 Take a look back at the surprising stories and creative teams of Marvel's UK Star Wars comics. 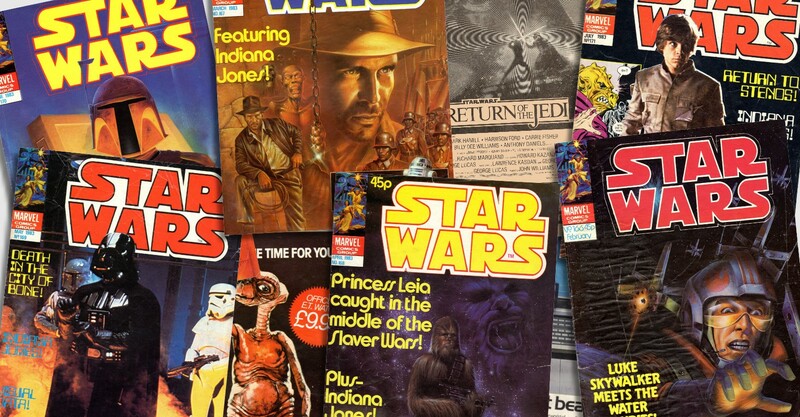 Back in October we took our first look at a much-loved run of Marvel UK comics, the Star Wars monthly title, which ran from #159 in July of 1982 through to issue #171 in July of 1983. 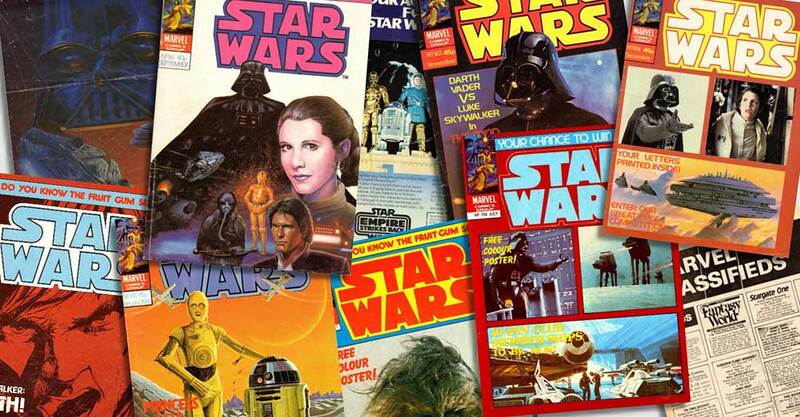 Packed to the gills with classic Star Wars action, images, competitions, fan art, letters pages, and more, it spanned the endless three years wait between The Empire Strikes Back and Return of the Jedi. 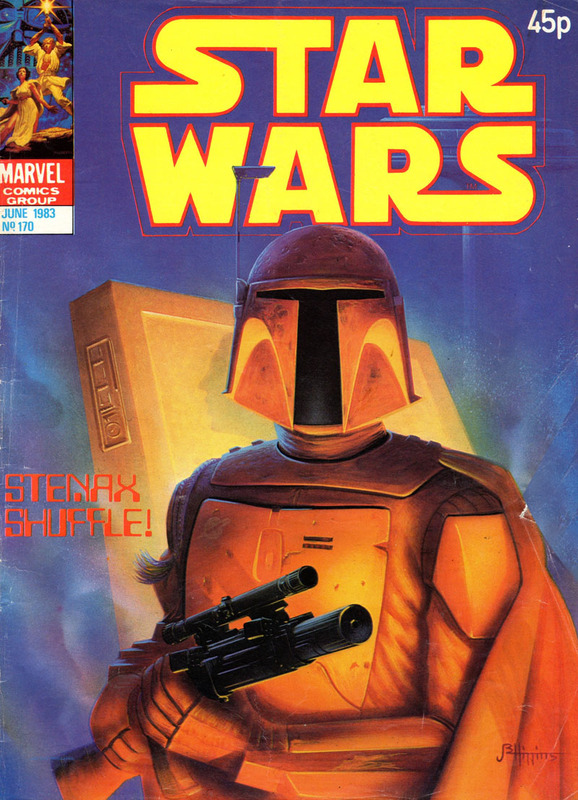 To complete our retrospective, here’s a look at issues #166 through to the final Star Wars UK monthly title, #171. 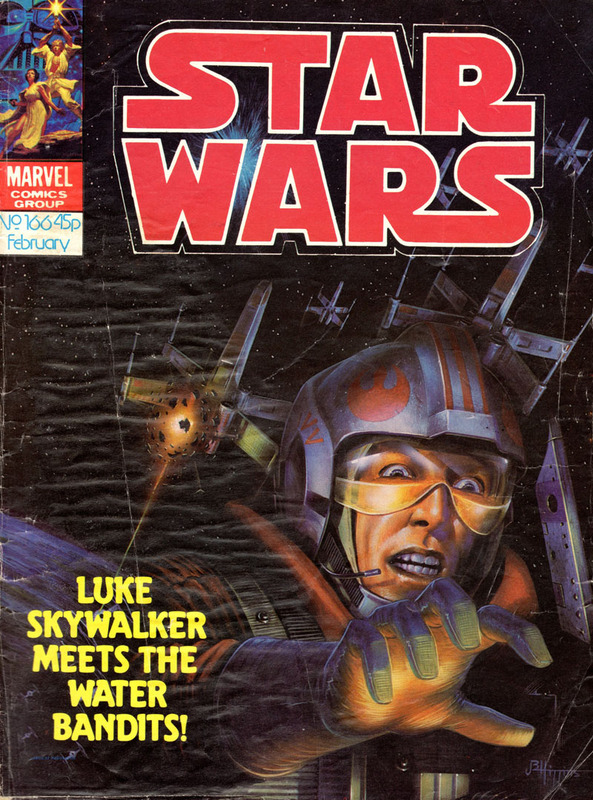 Cover dated February 1983, issue 166 came wrapped in an action-packed cover by Marvel UK stalwart “Jolly” John Higgins, featuring a panicked Luke Skywalker under heavy attack and escaping a world with a handful of X-wing fighters. The issue reprinted #66 of the US monthly “The Water Bandits,” written by David Michellinie and drawn by Walt Simonson and Tom Palmer. This classic tale saw Luke on the arid world of Beheboth, fighting against a group of brigands who had taken control of the planets water, right in the middle of Simonson’s amazing run on the title. We were also treated to the return of Rom and his fellow space knights in their fight against Galactus, while an ad promised the imminent arrival of “The Further Adventures of Indiana Jones” in the next issue. Tales of the Watcher brought us “The Next Galaxy” as a space-faring race traveled to our galaxy and immediately viewed it as a paradise. To protect us from destruction they declare our galaxy uninhabited. March arrives around yet another whip-cracking image, this time of adventurer of Indiana Jones by “Jolly” John Higgins. This reprinted the US issue 67 “The Darker,” written by David Michelinie and drawn by Ron Frenz and Tom Palmer. 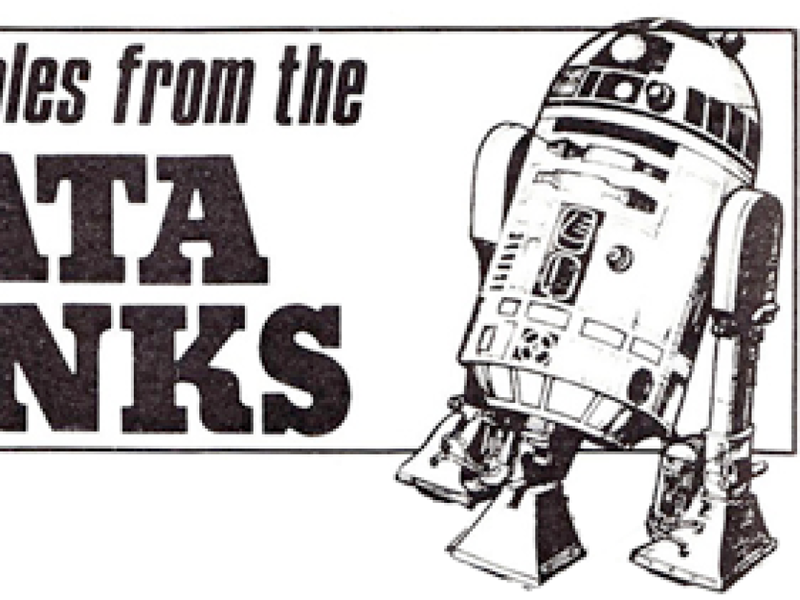 This saw the first appearance of everybody’s second favorite Star Wars rabbit, Plif the Hoojib (my personal favorite floppy-eared hero) and focused on Artoo, Threepio, and Chewie taking on the Darker. 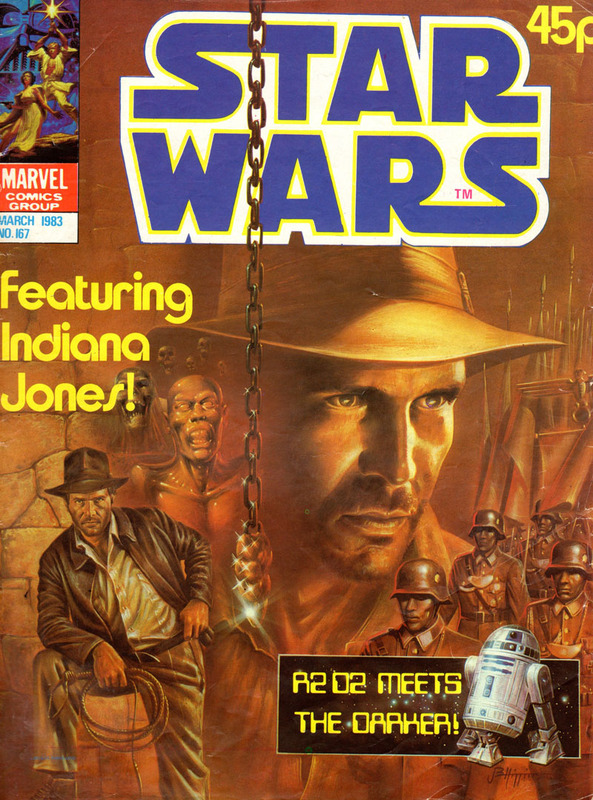 As teased in the previous issue, #167 also featured the first appearance of “The Further Adventures of Indiana Jones.” Written by John Byrne and drawn by the champion tag team of Byrne and inker Terry Austin, the popularity of Indy as a back up strip led to a UK Indiana Jones monthly magazine launching later in October 1984, which would run for 11 issues along with a 1984 Christmas Special. The magazine also gave you the chance to buy an exclusive E.T The Extra Terrestrial watch for £9.95 and on page 26 featured images from the galaxy’s greatest movie The Empire Strikes Back. 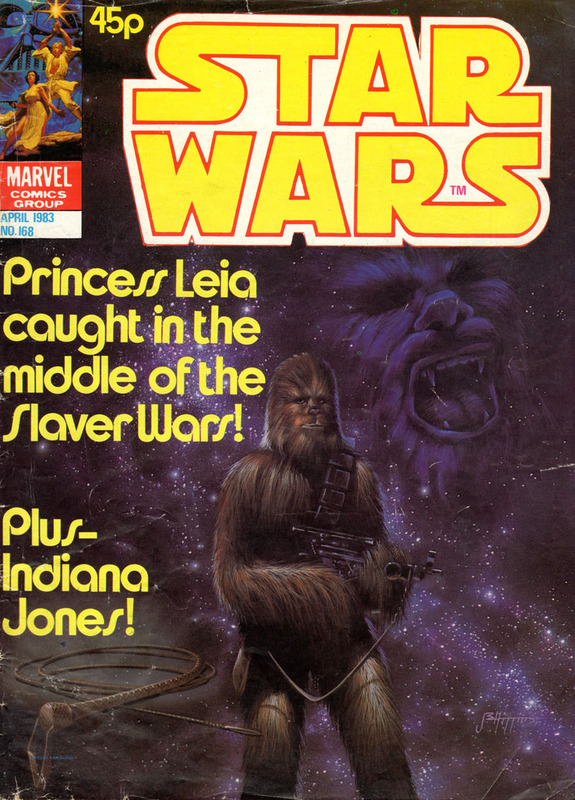 April 1983, and a stoic Chewbacca stands in front of a starfield next to and Indiana Jones’ whip. Once again by “Jolly” John Higgins, he had by now cemented himself as the man for Star Wars UK covers. 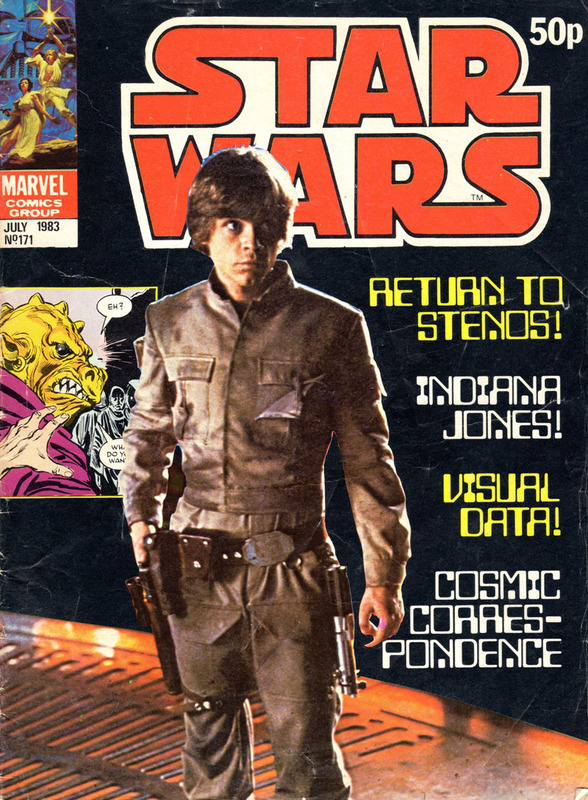 A two-strip issue, this focused on a reprint of the US issue #68 “The Search Begins,” the storyline which would run right up to the first issue of Return of the Jedi. Written by David Michelinie with layouts by the legendary Gene Day and inked by Tom Palmer, this iconically featured a pensive Princess Leia in her X-wing outfit heading out to the world of Mandalore in search of Dengar, to help track down the lost Han Solo. Packed with (now sadly largely defunct) background details on the Mandalorians, this issue even showed us a little-seen image of the Emperor. Old-time Marvelites and seasoned Star Wars readers remember this issue well. Meanwhile back on 1930s earth, Indiana Jones continued his latest adventure by Byrne and Austin in a story that’s as epic as Indy adventures get. Readers had the chance to buy a View-Mater Showbeam, allowing viewers to project 27 action-packed slides onto your bedroom wall for just £4.99 as well as an ad for The Perfect Mailing Company which gave the chance top buy UK Marvel back issues and subscriptions. 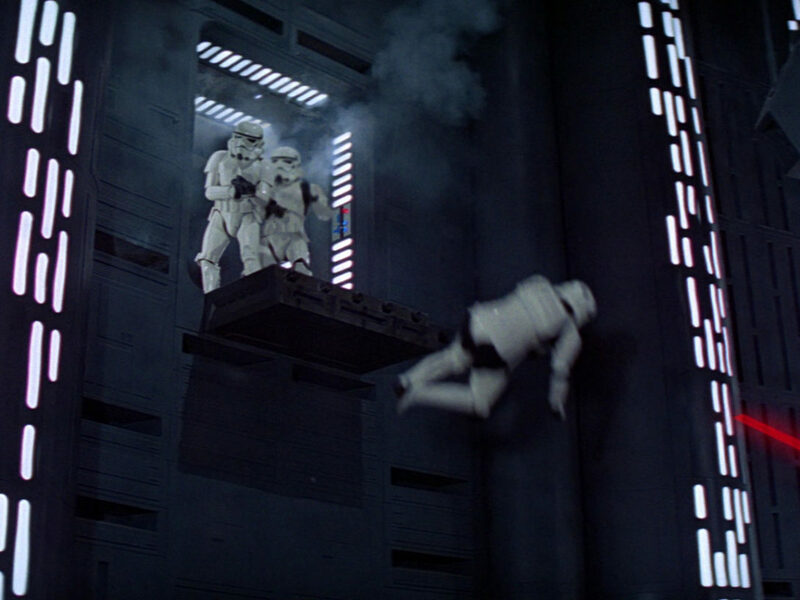 May 1983, and Lord Vader has the cover, standing implacably in the carbon freezing chamber as seen in The Empire Strikes Back. This issue reprinted the US issue #69’s “Death In The City Of Bone,” written by David Michelinie, drawn by Gene Day and Tom Palmer (and edited by Jim “Mandalorian Protector” Shooter). This saw the Mandolorian group of Tobbi Dala and Fenn Shysa help Leia and co escape from the clutches of Dengar and the Empire and ended with a return to The Wheel as the search for Solo continued. The issue is completed by another episode of “The Further Adventures of Indiana Jones” by Byrne and Austin (the final story by the superstar duo) and features all the regular ads and letters pages you’d expect. June 1983 and Higgins returns with a striking Boba Fett cover, standing in front of a carbonite block holding an unknown character captive. This issue reprinted the classic story “The Stenax Shuffle” from the US issue 70. Written by Mary Jo Duffy (who I interviewed in episode 6 and episode 7 of RADIO 1138) and drawn by Kerry Gammill and Tom Palmer, this took us back to a time shortly after Solo and Skywalker joined the Rebellion, when they visited the world of Stenos and came across Rik Duel and the Zeltron Dani. Our heroes return years later is under questionable circumstances, not knowing if they’ll be welcome. The letters page bears reading. In the years before the Internet, all us young readers had to go on was playground rumors and snippets in newspapers and magazines. The prevailing belief was that (as Cosmic Correspondent Colin Rennie wrote) “as you no doubt know, our heroes are killed off or something similar.” In the run up to The Force Awakens it’s interesting to see that the more things change, the more they stay the same. Indiana Jones returned, this time written by DC comics legend Denny O’Neil and drawn by the veteran Gene Day. 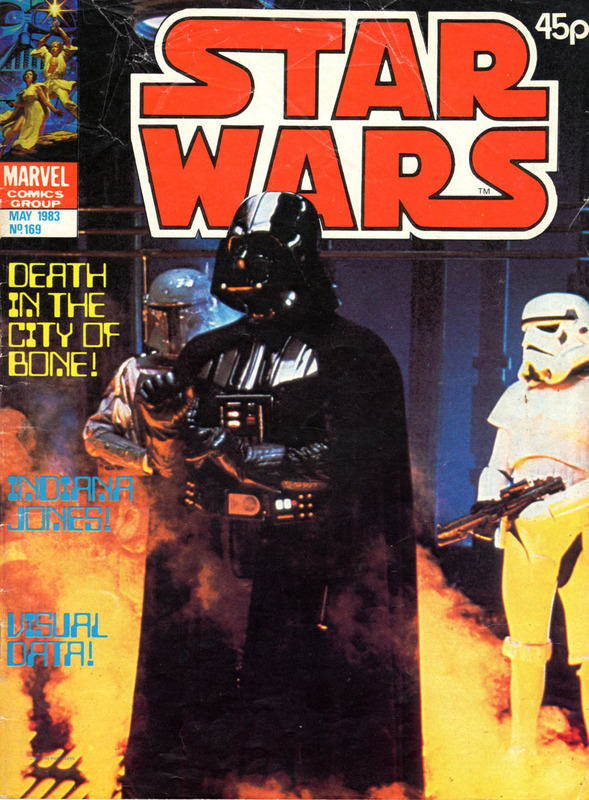 The final Star Wars monthly issue, cover dated July 1983. 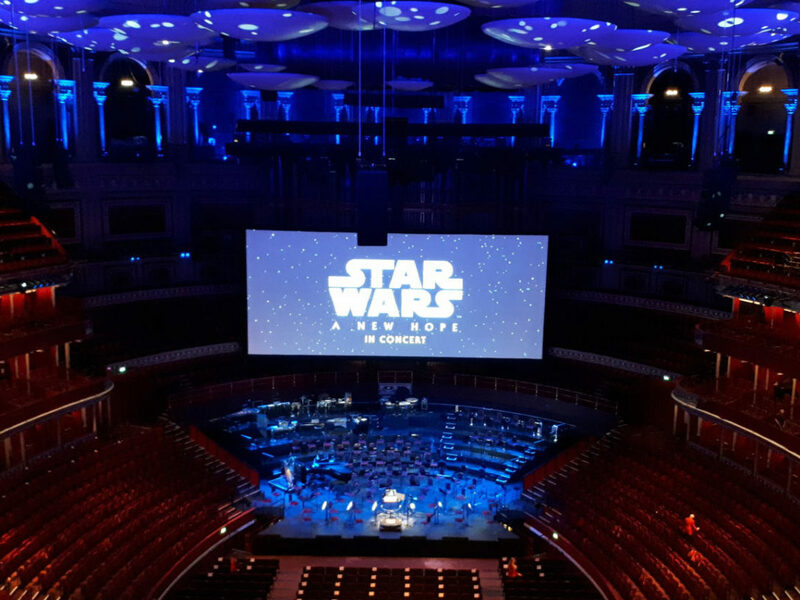 By now Return of the Jedi had arrived in the US on May 25, and here in the UK on June 2, and the galaxy was ready for a change. 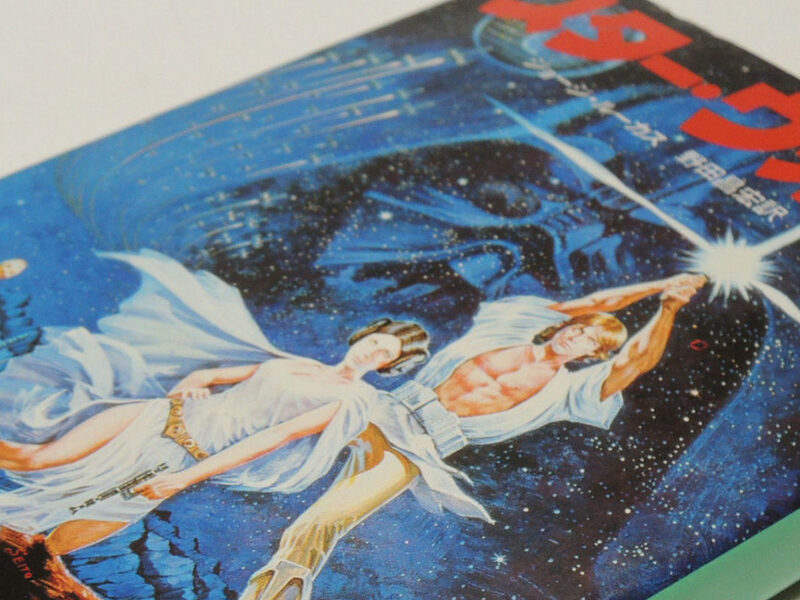 Behind a photo cover of Luke Skywalker as seen on Bespin in The Empire Strikes Back, the issue not only increased it’s price from 45p to 50p (half of my weekly pocket money, an an age when Palitoy Star Wars figures cost £1.50!) but also took us back to Stenos, reprinting “Return to Stenos” from US issue 71. 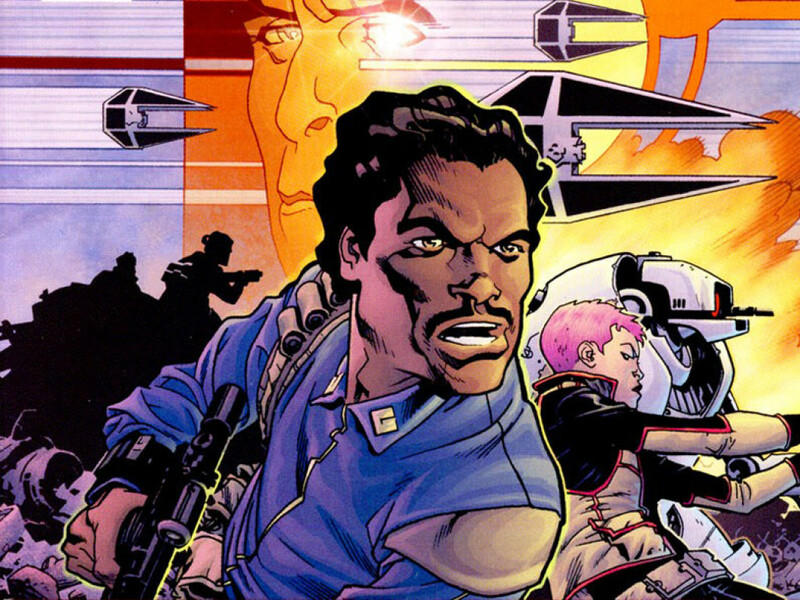 Written by Jo Duffy and drawn by Ron Frenz and Tom Palmer this saw the gang of Luke, Lando, Chewie, and Artoo return to Stenos and run into Lando’s old nemesis Drebble as well as Rik, Dani and — in a roundabout way — the Rodian Chido. 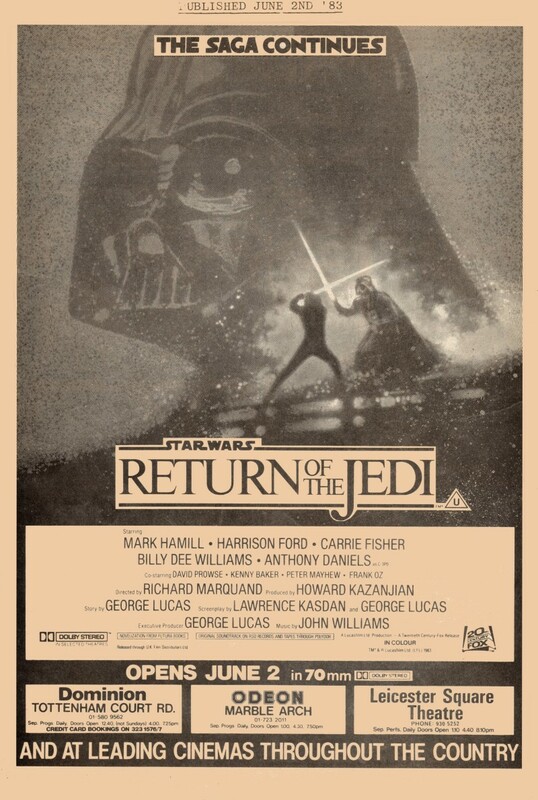 After the final page of Star Wars action there’s an an ad hyping the arrival on June 16 of Return of the Jedi Weekly (interestingly there was the thought of continuing the numbering system started in January of 1978, but Return of the Jedi Weekly would start with issue 1), a title that would ultimately run for 155 weeks. So, there you have it. 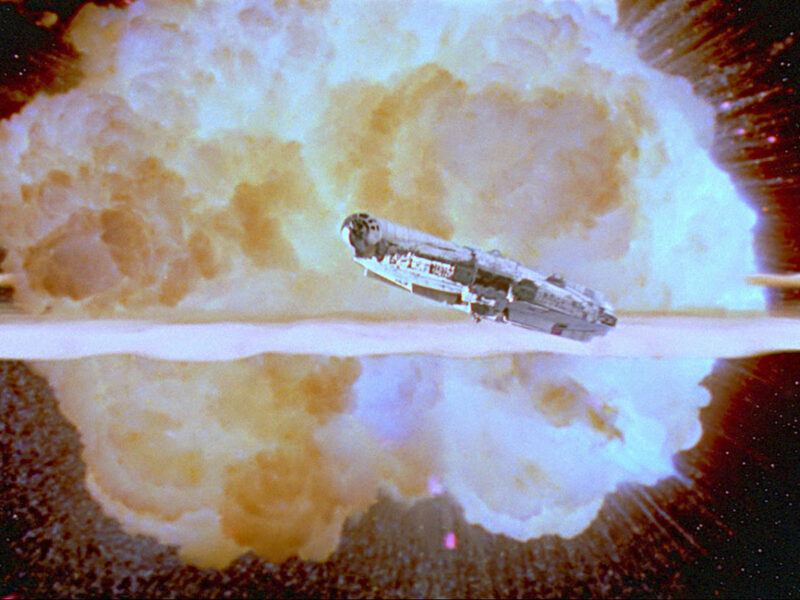 A brief look into 13 months of amazing Star Wars adventures and nostalgia. For fans around at the time this is a much-loved title, bridging the gap between movie episodes as well as igniting our imaginations and schooling us in the wider Marvel comic history. We can only hope that the kids of 2015 are so lucky. 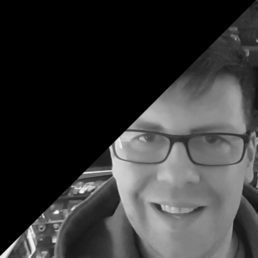 Mark is a long-time contributor to Star Wars Insider, the co-owner of Jedi News, a regular contributor to the UK’s biggest free newspaper The Metro and co-host of RebelForce Radio’s UK-centric RADIO 1138 podcast. When he’s not talking or writing about Star Wars, he can usually be found sleeping, where he’ll most likely be dreaming about Star Wars.